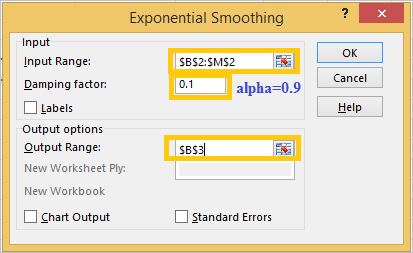 In this tutorial we will learn how to implement Exponential smoothing in Excel for a time series data. Statistical smoothing technique for detecting significant changes in data by ignoring the fluctuations irrelevant to the purpose. Step 1: First, let’s plot our time series, which is shown below. Step 2: On the top right corner of the data tab click data analysis. Step 3: Select Exponential smoothing and click ok. Step 4: select the input range and output range, then mention the damping factor. 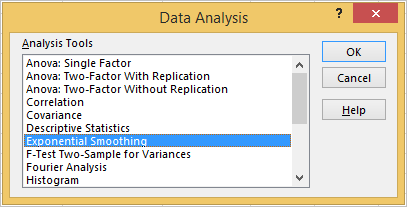 More the damping factor, the smoother the data will be. Step 5: Now add two more smoothing in the same way as we seen above, with damping factor =0.5 (alpha=0.5) and damping factor=0.9 (alpha=0.1). As you could clearly see when the damping factor increases (alpha value decreases) more smooth the data becomes. Alpha =0.1 have the least Fluctuation, whereas alpha=0.9 have most fluctuation.